Last decade of globalization indicates that international trade has many things to do with people's livelihoods and their most basic social and economic rights. Trade which is built on the unacceptable levels of social inequities to vulnerable communities and groups, or causes global ecological or environmental damage and disregards our obligations to future generations is not contributing to development. In the so named “developing” countries globalization mean the opening of trade by reduction of import duties and removal of quantitative restrictions- also entering the World Trade Organisation (WTO) regime. Besides slackening of restrictions on external trade, there has also been a removal of some internal restrictions on movement of commodities. International Monetary Fund (IMF) plays it safe, calculating output on the basis of an estimate of the country's capacity to pay for imports, whether from exports of goods and services or from inflows of capital. Part of the globalization process was introducing new principles, policies that would fit with the demands of globalization in the era of neo- liberalism; corporations and securities are institutions which were generally unknown until the 19th century. Today these institutions are ubiquitous and influential everywhere. The increasing employment of female by TNCs has permitted researchers to analyze female's direct links to the global assembly line. The subordination of female is part of the same process that has generated the exploitation of colonies… in the world economy. Thousands Export Processing Zones (EPZs) all over the world, employing approximately millions of workers of whom most are female. Foreign Direct Investment (FDI) of TNCs flows to countries where wages are exceedingly low, which implies a high profit rate. The Chinese EPZs alone employ more than two thirds of the world total. Like many others Chinese government adopted the first work code, offering protection on wages, working hours, employment regulations, holidays, etc. Yet it is rare to find incidents where the code is enforced. These encourage the TNCs and their sub-contractors to conscientiously take advantage of female workers, who make up the absolute majority of the working population of the EPZs. And it is work and enterprise of the female workers which creates the wealth of the nation leading to the national growths- contributing grossly in the national economy. Evident trend is that TNCs always prefer to hire female. As female workers are easier to lever by the management as male workers is more difficult because they are less likely to tolerate the malice. Female workers, since they come mainly from rural areas where female have been oppressed for thousands of years and thus made to be more obedient, they tend to be more tolerant even when unscrupulously exploited. Work day in the EPZs lasts as long as 10-12 hours. Workers find it hard to muddle through with such hard work, but any refusal to work overtime will result in their being fired. If female workers get pregnant, their own choice is resignation since they would be unable to endure such hard work. The employers then need not pay any maternity leave, although the law requires them to pay. Wages are shamefully which is not even enough for food. Many female workers over-work at the expense of their health. Added to this is management's harsh policy of “no sick leave, restrictions on using toilets, and high medical expenses charged by both private and public hospitals. Thus female workers often bear bad health. Occupational accidents and exposure to toxics are severe problems. 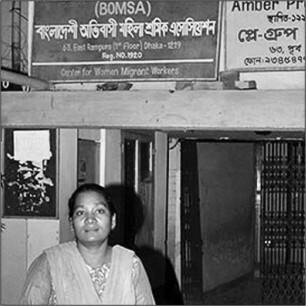 Aside from physical health disabilities, female workers suffer spiritual damage from being forced to separate from their families, having few support groups in the cities, sexual harassment, etc. Not only does the government reject workers the right to organize but the work department and official trade unions are so anti-work that they often refuse to enforce existing laws when they are favorable to workers. Established and large companies such as TNCs came in and brought in their finished goods at much cheaper prices than those of our own manufacturers, thus forcing many local industries to close down. In Zimbabwe, the clothing sector was hardest hit with the closure of the local Cone Textiles, which retrenched thousands of female workers. These workers were family breadwinners with children in schools and houses to pay rent for. Before the advancement of free economic activity on the national, regional and global levels, most of the African economies were heavily regulated by the state. Under this system, they introduced such import and export restrictive business practices as import and export licensing, increased import duties, taxes or levies on import transactions, allocation of foreign exchange to essential goods, import and export quotas and other prohibitions. However, this has gradually been replaced by donor-driven deregulation, economic liberalization and privatization of the national economic activities. In Central and South America as well as Africa- within their new economic structures female played an important role, becoming effective organizers and leaders, and benefiting from programmes that addressed their needs. However, as these regions have been increasingly drawn into the global economy, forced by powerful international lenders to adopt policies of structural adjustment and financial stabilization, governments have lowered public spending, privatized public industries, imposed regressive taxes, and marginalized small producers. While poor and working people are generally hurt by these policies, female are especially vulnerable since cutbacks in the public sector mean that social services are shifted from the paid to the unpaid work of female which, in turn, limits female's participation in the public sphere. The World Bank (WB) loans and the IMF imposed Structural Adjustment Programmes (SAPs) and have stripped many female of what meager health and education benefits were once available to them. Female's formal sector unemployment has increased due to IMF-induced recessions, privatizations, and government cutbacks. In Africa, incentives that switch land and work to export crop production have forced female to reduce time tending farm plots that are the basis of food security, and then spend more time as unpaid workers. For female in Asia, export-led growth has taken on a different dimension. Not only do female dominate as workers in export industries, but they themselves have become the important exports. Conditionality as an enabling principle of all the IFIs involved other policies as well like deregulation, liberalization, privatization etc. roughly speaking, conditionality has been linked with a monetarist approach. While loans approved to female provide small amounts of capital, they are structured with the idea that economic activity of female is exclusively small-scale, supplementary, and tied to domestic needs. Even though the programmes do nothing to affect larger neo-liberal economic structures which continue to reproduce gross inequalities in income they have the unintended consequences of empowering female in their families and communities. Addressing the issue the UN Commission on Human Rights in their “Globalization and Transnational Corporations” report (E/CN.4/Sub.2/2000/13) added that the “race to the bottom” has seen developing states engage in a competition to provide the best investment environment by progressively lowering, inter alia, work standards; the phenomenon of quantitatively increased employment opportunities accompanied by low-quality conditions of work is manifested especially in the EPZs, where female provide up major portion of work requirements. Paradoxically, the problems created by the economic and political forces of globalization have spurred female to organize and to step in where state services and supports have been withdrawn. The fall of communism in the former Soviet Union and its satellites had led to losses in basic needs and social welfare provisions. At the same time, however, it has also stimulated the growth of female's activism in response to the problems created by the economic and political transition. The political marginalization of working class female and their exclusion from local and state legislatures, often as a consequence of the ushering in of liberal democracy and capitalist market relations, has also prompted female all over the world to establish local organizations and actions that promote female's political participation, strengthen civic education, and develop female's leadership. Similarly, organizations in Singapore and the Alliance of Arab Female in Egypt actively promote female's participation in electoral politics, offer alternative perspectives to policy makers and influence policy outcomes by formal and informal means. Female's struggles in the economic South are inventing new forms of political action, affecting both daily survival and the economic sphere at the global level, and creating new policies. Scheming TNCs is challenging because of the absence of powerful international regulations and inconsistent national legislation. Corporations that conduct business in several countries can therefore often engage in corporate behaviors that are illegal in one country but not in others. It is reality that TNCs are now major global actors, many larger than most nation states. And they are evolving to address the broader demands of their customers, shareholders, employees, and community stakeholders. And we already have seen that these new demands go beyond the traditional bottom line to address issues of human and to be focused female workers rights. Whether a new transnational corporate social structure of accumulation is to be emerged in the global economy to promote long-wave upswing- three main engines of potential growth; and the evidence of profitability, accumulation, productivity, and growth- is a matter required in depth analysis. But imposition of human rights duties on TNCs that commit wrongs in the developing world may be a way forward. Given that the trend of closer economic and political ties among the world's nations is not likely to be reversed in the near future, it is immensely important that all peoples, regions and countries of the world are able to take part in shaping the policies and actions of multinational bodies. If globalization is to proceed not only on the terms of rich, white men from the West, female, as well as men, from all groups, countries and regions of the globe must have a voice in what we want the world to be and become in the future. The writer is a Legal Analyst.